In the morning, after a hearty breakfast, Dutchess, President, Bowie and I say goodbye to our dear friends, take loads of pictures and we start hiking out. I’m pumped and excited! I’m going to hike the first 82 miles to Trout Lake for the 2nd time. This time, hopefully in better conditions than mid-June (when I hiked through tons of snow a few days out of Cascade Locks). 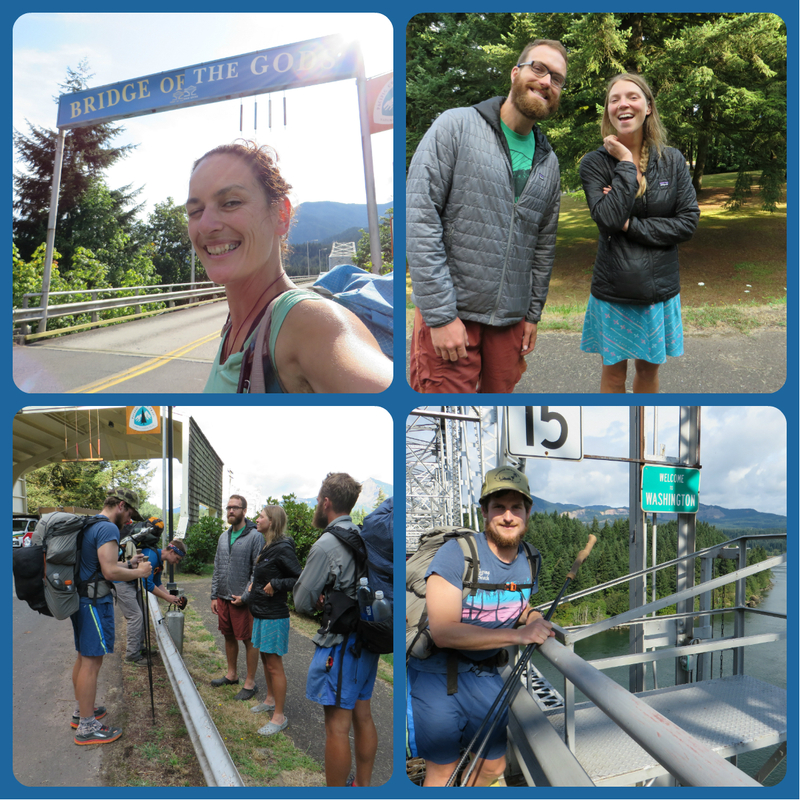 We hike over the Bridge of the Gods, and we do a full photo shoot, take some more pictures, to the annoyance of the many cars that pass us. Right in the middle of the bridge we cross the border. Washington! For most hikers who started in Campo, SoCal, this is the final state of the three states the PCT runs through. I still have to do the major part of California after I finish Washington. Lucky me! Saying goodbye to our friends Uke and Smiles. 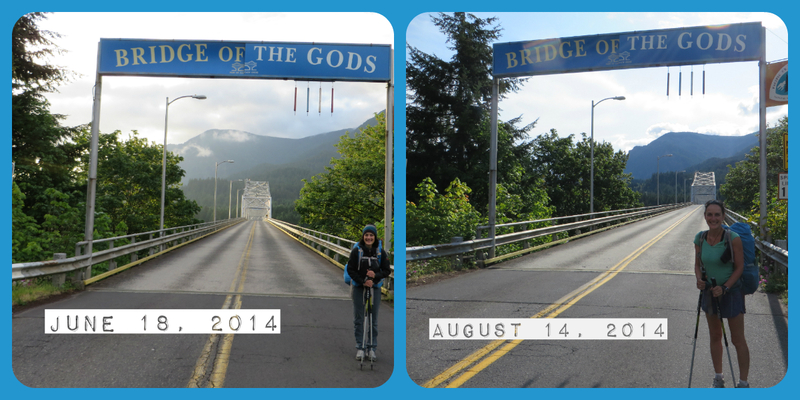 Crossing the border into Washington over the Bridge of the Gods. Hikers can cross toll-free! Hiking the first 82 miles of Washington again leave me amazed; the trail is beautiful and some parts I don’t even recognize without the snow! I’ve gained strength too. I needed 5.5 days to complete this section in June. Now, just 3 days! After a few days we arrive at Goat Rocks Wilderness, a remote and rugged area in Central Washington, named after the many mountain goats that live in the area. We spend the night at Lava Spring campsite, with a beautiful crystal clear spring that flows out of the lava beds. The nights are starting to get cooler I notice, we are at 4500 feet elevation and summer is fading. The next morning, I wake up after a very good night sleep. I always sleep deeper whenever I camp with people. I feel more relaxed and at ease. Fellow hiker Brunch is the first to hike out before 6 am. He says he’s going for a 33 mile day and leaves the dust for me to bite in. 33 miles! 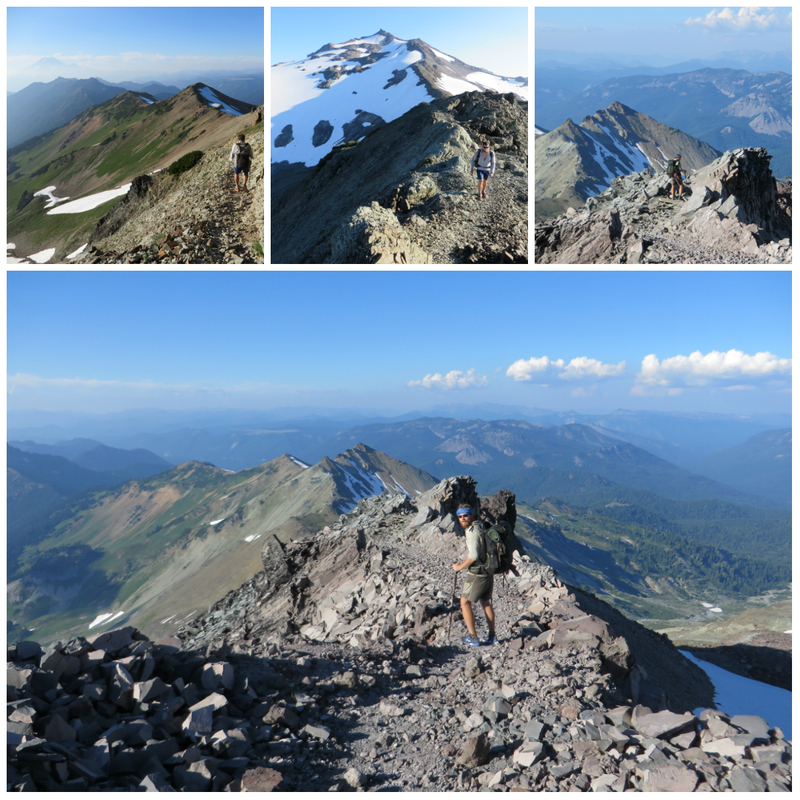 An insane distance and goal setting for today, since we will hike over ‘The Knife’s Edge’, an exposed walk over the spine of Goat Rocks, a section frequently described as the highest and most dangerous of the PCT in Washington. It traverses 2 scree slopes, snow fields to cross through late August and prone to rock fall in storms. I think he is crazy for setting this goal for himself. Bowie is the 2nd hiking out. I’m 3rd, after wishing the other hikers a good morning and hike. Dutchess is busy filtering his water but I know he will catch me, since he is a faster hiker than me. Soon I catch Bowie. And then Brunch, with whom I leapfrog for a while. Brunch is a strong hiker and he does hike fast today! When I stop to get water at a creek, he bypasses me and I get to bite his dust, again. I feel good today. And strong. I hike and hike. I blast my beats from the little speakers on my phone. Mr. President gave me a 2nd trail name: Nordic Rave, because I have the meanest music on my phone, which helps me to hike strong. My first 15 minute break at a trail junction is after 5 hours of non-stop hiking. I drink my Gatorade, have a toilet moment and eat candy from my food bag. After the break, I hike another hour before I catch Brunch. He is having lunch at a creek. The flies are biting me incessantly and I can’t stay here a minute longer. I quickly fill my water bottle and climb my way up to Cispus Pass. I’m ahead of the whole group today and hike through an amazing landscape of alpine meadows, numerous waterfalls and mountain flowers. It’s awesome. When I have my lunch break at around 3 pm, Brunch catches up with me and we sit together in silence, near a waterfall, which makes so much noise we can’t have a normal conversation together. Brunch hikes out and leaves me again. The trail gets steeper and I’m losing my energy and pace. I’ve never been strong on ascends and I drag myself up to a junction at 7200 feet elevation, where Brunch is waiting for me. It’s 5 pm and I start to wonder where Dutchess is. We have a great view over a snow field when we finally see a hiker running up the field. It’s Dutchess! We are all happy to see each other, Dutchess, rather tired, has been working hard all day to catch us. Great effort! 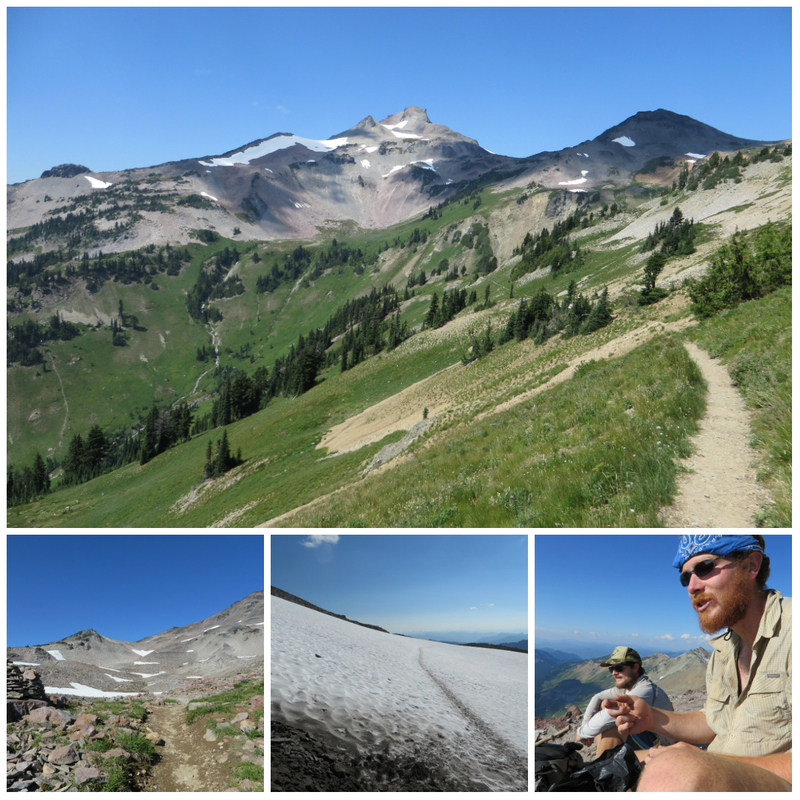 The beautiful hike up to the ‘Knife’s Edge’ through Goat Rocks Wilderness. Brunch and Dutchess break at 7200 feet elevation. The three of us start to hike up ‘The Knife’s Edge’. The weather is perfect, the sun is setting. The views are stunning. This is the best day on the trail so far! The trail runs over the spine of the mountain, with steep slopes on either sides of the trail. It’s amazing how far we can see. I feel so lucky that life offers me this abundance of good people and the awesomeness of the beautiful nature around me. Hiking the ‘spine’, The Knife’s Edge. Stunning views. Not for the faint-hearted. After a couple of miles the trail descends down and Dutchess and I catch up with Brunch again. He has set up his tent already. But he has only done 31 miles! I challenge him to do another 2 miles with me, but he wants to stay where he is, this campsite has a private waterfall and when do you get that privilege? Exactly. Almost never. Inspired earlier today by Brunch I decided to hike his goal, 33 miles, which is my longest day ever. Dutchess secretly wants the private waterfall too, but I am determined. Another 2 more miles, no matter how tired I am. I feel high from hiking, a natural high. I’m all giggly while the trail is not about to give me an easy finish. Dutchess decides on hiking on with me but keeps whining about the waterfall. Finally, we reach our campsite for the night. A flat spot next to an mosquito infested pond, in the middle of the forest. Not the picture-perfect campground with the waterfall a few miles back, but I’m super stoked about my new personal record. 33 miles in one day over Goat Rocks! We cook dinner. To celebrate, I allow myself having two freeze dried meals of Spaghetti Meat Sauce instead of one. We cowboy camp under the stars. I watch satellites and planes fly over. I count the stars. I sleep. ← My personal trainers, or how I learned to hike strong. WOW, what an achievement!! amazing! and what a stunning views! Happy to read a story again.